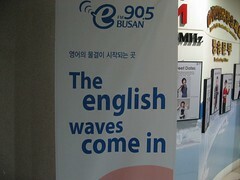 When I agreed to do a weekly segment on Busan e-FM's show Inside Out Busan, which came to be known as "Open Mike in Busan", it was due to a confluence of reasons, but even though I was invited onto the station because of this blog, none of my reasons for agreeing to appear on the radio were connected with it. I could have promoted this blog as part of the show, and I expect that many other bloggers would have seized that opportunity, but as every company that has ever tried to employ me will testify, I am not most other people. I write because I can, I write for myself, and that other people have come to follow my blog has been the source of endless soul searching for me, because while I like to write, my motivation does not require a readership, and frankly sometimes ebbs because of it. But I ended up feeling that ignoring my radio work on this blog had become a disservice to both this blog and the radio show, and while I have avoided promoting my blog on the radio, it would have been nice to provide the background material to my appearances for those who found it. I’d also mentioned some regret at not doing so to the show's producer, and the genuine look of disappointment that crossed her face made me feel that at some level, I hadn't done my best for the show. Given that this was my first experience – and perhaps my last - of working in a Korean business environment, it wasn't the lingering memory I wanted to have of it. I haven't updated this blog much in recent months, and there are a lot of reasons for that too, not least of which is the work I've put into preparing material for the radio segment. Between the five hours average that took every week added to the three hours or more I was travelling to and from, or at, the station, in the last six months I've lost over eight hours a week. Add having a newborn baby to this, plus some other reasons that might eventually become apparent, I lost the time that I used to have to write here. I'll write more about the station later, because more deserves to be said, but what I'm going to do this month is write up the companion pieces for my radio segments that I should have been posting all along. And perhaps it will serve as a useful summary of some of my Korean experiences, while kick-starting me into the habit of writing it regularly again. Consider this to cover Week 1 – which was an introduction to who I am. Tomorrow, I'll begin in earnest with Week 2. The entries that will follow are not an exact transcript of the show, but rather a close approximation of it based on my script and script notes, written as an article without the spoken interview-format interjections and mistakes, and the occasional timing issues which necessitated cutting things short. Consider them a 'director's cut', if you will. edit: As it happens, Koreabridge has since extracted the audio for Weeks 3 and 4 and made it web-friendly (links provided in the posts below) - thanks! I'll try and get around to doing the rest, if the station gives me permission to do it.